Aaron is Chris Clarke and vice versa. Am I Chris Clarke or Aaron Aalborg? I chose the pen name Aaron Aalborg to come first in any list and to avoid annoying people bothering me for writing controversial material. My recipes for cooking Trump and the British Royal Family are good examples. 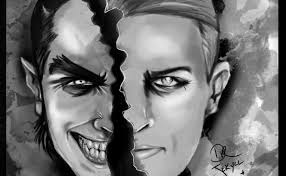 Over time, I developed a Jekyll and Hyde, split personality. It can be fun, but is rather disturbing to others. I decided to write a couple of books as Chris J Clarke. Aaron needed taking down a peg. He was getting too bumptious. Now, he hardly speaks to me and just glowers at me in the mirror.